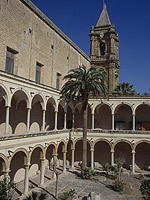 One of the most important Sicilian museum, the Pepoli Museum is a stage not to miss. Of remarkable historic-cultural interest, the museum originates from a municipal collection that increased by various gifts and by the collection of the general G.B. Fardella. In 1902 it was the Count Agostino Pepoli, it was nominated from, that, adding its collections, took care of its first accommodation. 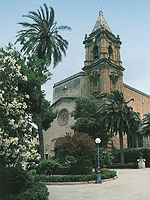 Situated in via Count Agostino Pepoli, in the fourteenth-century ex-convent of the Carmelites, is placed side by side to the “Santuario dell’ Annunziata” ( “Sanctuary of Our Lady of Annunciation”) or “Madonna di Trapani” (“Madonna of Trapani” ), in the garden of which there is the entrance to the Pepoli Museum. Inside, it is possible to visit a wide assortment of collections, that attract visitors’ attention. It is a place that testimonies one of the most important activities of Trapani area, the art of coral, known and esteemed all over the world. But besides to give much space to the decorative arts, at the first floor you may appreciate the Picture-gallery, where painting and sculpture works of modern and contemporary art are lodged. The museum preserves hundreds of pieces such as holy water stoups, crucifixes, sacred and profane jewels, chalices, and is the seat of the exposition of Christmas Cribs, up till now produced by local handicraft, that are real masterpieces made by coral, copper, ivory and sea materials. To be noticed is the accuracy of Sicilian jewels, the archaeological findings, the coins, the polychromy of the pottery, and spectacular eighteenth-century floors depicting scenes of tuna fishing. To be mentioned, among the donations made to the museum, the ones of Count Hernandez of Erice and of the Sieri Pepoli Hospice. The museum is every day open to the public.